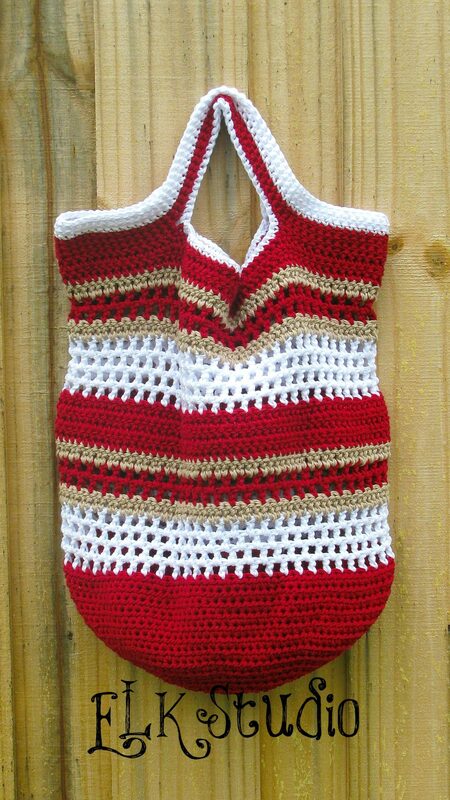 Free Fun in the Sun Crochet Beach Bag! It’s no secret that Sinfonia Cotton yarn is my favorite yarn for the summer. It seems once I pick it up…..well, I can’t stop. I love the feel of the yarn but the strength is also a plus. The cotton is mercerized which means it’s already been stretched, so it doesn’t have that much play once you make the project which is perfect for my Fun in the Sun Beach Bag! 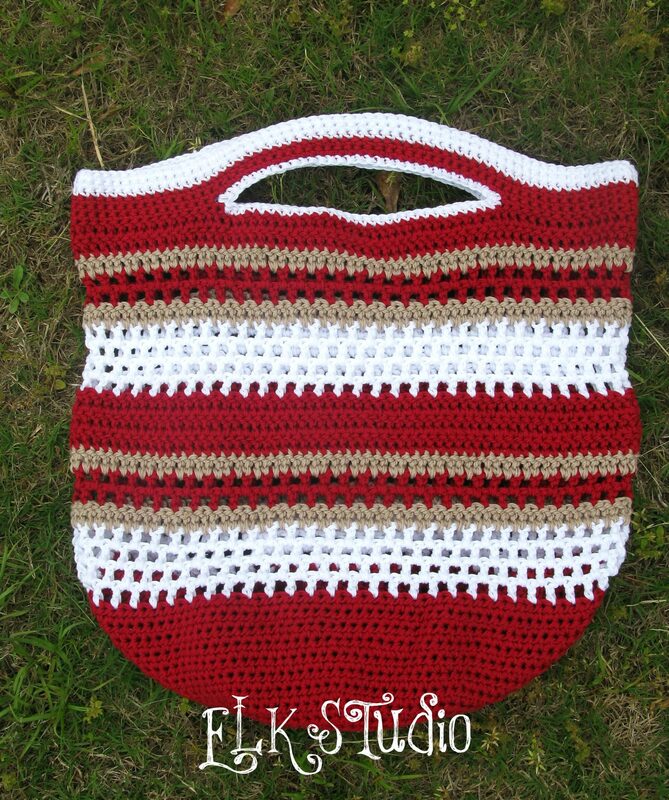 Hubby is taking me to the beach this year….so I wanted to look all cute with my very own crochet bag. I decided to make the bag even stronger and used 2 strands of the Sinfonia but the pattern is very versatile and you can really use your own imagination on whether you want double stranded or use a thicker yarn and proper hook size and just do it single stranded. The choice is yours! Note: I didn’t want my handles to be long, so I only chained 30. If you would like longer handles, just increase the chain but you will still follow the instructions accordingly just ignoring the ch 30 part. Round 43-45: ch 1 and sc in same sp, sc in next st and around, join by sl st in first sc (120 st) Fasten off. I liked the idea of the white being inside the handles, so if you want them too, here’s the instructions. Join with Color B, sc in first st and around, sc in corner, sc in bottom loop of sc and in each st around, sc in corner, join by sl st in first sc. Fasten off and weave in all the ends. Fasten off and weave in all the loose ends. I hope you enjoy the pattern! I’m thinking I need one of my big brim hats to match the bag. What do you think??? Have a great day and be blessed! I’d love to see a hat to match. Love the colors! Thank you for the pattern. I think I’ll give it a try. I love this bag and want one but I don’t know what is going on with my bag. I’m following the pattern to the letter but I keep ending up with something that looks like a rippled flower at round 13. I’m not using the same yarn as you but I’ve tried different yarn and different hooks and it always comes out the same. I’m new to crocheting but this looks pretty easy. I guess I should mess around with increasing but I don’t understand why if I’m following the pattern it’s not working. I’m not sure what is happening because you are only doing simple increases until row 13, i agree. I can only think of possibly a tighter tension that could cause the ripples as the patterns increases. Made the bag. Love it! Thank you for the pattern. Your patterns are always so easy to follow and create great products. Just finished one and I love it. It’s a gift for my future daughter-in-law. We are traveling to Punta Cana in June for our son’s wedding and I thought a beautiful beach bag would be a fun gift for her. I made it in turquoise, lemon yellow and white to give it a tropical look. I just LOVE this! ♡ Thank you so much. I am almost done with this bag! What a great pattern! Thanks so much for sharing it. Is this in English or American? The pattern is written using American Standards. hope this help! Am I correct in reading that you used 2 strands of yarn throughout the project? Do you think I need to do that if I used a cotton (4) yarn such as Sugar n’ Cream? Thanks. I did use 2 strands and Sinfonia is thinner than Sugar ‘n Cream. I would think one strand will be enough and you may not even want to do all the increase rounds either, but you can play that by ear. I am making this bag and I am up to Round 19 and i am a little confused, when i do round 19 I only end up with 60 stitches. If you have 120 stitches and for round 19 you skip a stitch it only comes to 60 for taat round. Hope you can help and tell me what I am doing wrong. Thank you. really love this bag. You aren’t doing anything wrong. Look at it this way. You will end up with 60 dc stitches that’s correct, but I’m including the ch 1 as a stitch too which you will have 60 of those and that equals 120. I hope this helps. Have a great night. Thank you so much!!! Thank you so much for all of your wonderful patterns too!!! You can purchase it from Hobby Lobby or http://creativeyarnsource.com. Hope this helps!! Love this! I might have to give this a try in red white and blue. 🙂 thanks for the pattern! Great looking bag! Love your color choices 🙂 pinned! This looks like such a fun bag! Thanks for sharing. What is an aligned single crochet from southern comfort cancer hat? It’s just another way of stitching the brim instead of using the traditional single crochet. You will insert the hook, YO and pull through one loop, insert hook back into the same space, YO and pull through all three loops. This stitch just allows for a stronger brim but is totally optional. If you don’t really like it, just follow the pattern substituting the pattern with single crochet stitches. Hope this helps you. I LOVE this bag!! It’s next on my list & I just printed it out. Thank you so much for the tutorial!! Thanks Shannon! I would love to see it when you’ve finished! It would be awesome with a matching sun hat. I think I may have to try it out!